Twelve-year-old Sei lives a normal, quiet life on a small island in Okinawa until one day a strange man who seems to know his mother shows up and tries to kidnap him. After that, nothing is normal or quiet in this sci-fi thriller from the author of Banana Fish. Thanks so much for scanlating this! I'm watching the drama adaptation of Yasha, and I'm interested in seeing what the original story is like. You're welcome! I'm working on chapter 2 now, so hopefully it won't be too much longer. I'm waiting for next ones too. Thank's for scanlating this ! I with you the best of luck with this very long project. Thank you for your courage and your dedication ! Thanks, glad you're enjoying it. :) It's definitely a long project and I'm kind of intimidated about it if I think about it too much, but I really love this series. I can't believe no one's translated it before. Thank you so much for the second chapter! I really love this series! Can't wait for more to come! Glad you're enjoying it. :) I hope to have the next chapter done by the end of the month. Thank you for scanlating!! I adore this manga! I beg you : please, go on! This story is wondderful! I'm glad you're enjoying it. I'm working on another chapter right now. I know it's been ages since the last update, but hopefully I will have chapter three out sometime this month. There is more coming soon. Thanks a bunch! I am looking forward to the new chapter ^O^. Thank you so much!!! I was thinking you dropped this project! But I'm so happy now!! I haven't dropped anything. Just been really slow. ^_^;; I'm glad there are people still interested. omg! thanks so much for this!! i hope this continue on! I'm so glad you've decided to work on Yasha!! I've been hoping somebody would pick it up after the other scanlators stopped years ago. Glad you're enjoying it! :D I hope to get back to it in a couple months (I took a break to catch up a bit more with one of the other series I'm scanlating). What a great manga, and a great translation too. :D Thank you so much for translating it! Thanks so much for taking the time to do this! TT_TT I started to watch the dorama also. I hope the next chapter comes out soon. I had hoped to have the next chapter out by the end of June, but I didn't quite get it done in time. It should be ready sometime this week, though! Yaaaaay, thanks for the new chapter! It`s different but it was still very good. Yeah, I saw the drama years ago and remember it being quite different, but I did enjoy it (though I like the manga better). I loved BananaFish and bought everything published in my country. 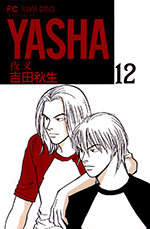 I enjoyed liveaction Yasha, and I'm thrilled to see you're scanlating the manga! Long overdue. Thank you so much! Glad you're enjoying it. :) Hopefully I should have a new chapter out next month. Don´t want to sound like an annoying fangirl :P, but will you release a new chapter soon? Since it's been taking me so long, I decided to split the next chapter in two and hope to have the first half (about 20 pages) posted this weekend. And hopefully not that long til the second half; I've been busy with a project that should be done with today and then I can get back into the swing of things. Thank you so much for this! It's wonderful that someone scantrad this awesome manga! I read a bit of japanese and sometimes this manga is kind of easy to understand and then BAM, pages full of text and kanji brrr lol you are very brave to translate it! Hi! Thank you so much for translating this series! I can only imagine the amount of time and work you've spent in this project… Amazing job! And amazing series! I really love this manga, thank you so much for translating it! Fighting!! I'm always there waiting for you!!! thanks for all your hard work!! I 'm such a fan of Yasha. That you translate all of it is a dream come true! i'm really loving this manga. and the translation reads so smoothly. thanks so much for your hard work and generosity in translating this and sharing. i am looking forward to this manga's completion. I'm looking forward to completing it, too! When I started this project it seemed so daunting, but now there's just three volumes to go. It should be done before the end of next year! I've been away for two years and now when I'm back this series is completed. Wow It feels just like yesterday, the very first day that you guys picked up the series! Life is up and down but thanks a lot for always being here. Hope you enjoy the ending!